The Cleveland Cavaliers have released their 2018-19 promotional giveaways and theme night schedule which features big #AllForFUN excitement for fans of all ages at The Q during the upcoming Cavs season. Cavs fans can view the entire promotional schedule by visiting Cavs.com/Promos and they can also lock-in great seats to any of the 41 regular season home games at Cavs.com/Tickets. The 2018-19 Cavaliers basketball season tips off with Opening Night at The Q Driven by Goodyear on Sunday, October 21st vs. Atlanta Hawks at 6:00 p.m. All fans in attendance will receive an Opening Night Cavs T-shirt presented by Cleveland Clinic. Five-time NBA All-Star, Kevin Love, will have a bobblehead giveaway Driven by Goodyear on Monday, November 26th. The Cavs 8th pick of the 2018 NBA Draft, Collin Sexton, will have his Cavs bobblehead debut presented by Mountain Dew ICE on Tuesday, January 29th. Cavs Forward Larry Nance, Jr. will have a bobblehead giveaway on Monday, February 25th, followed by a Cavs Legend Larry Nance, Sr. bobblehead giveaway on Friday, March 22nd. This special pair of father-son Nance bobbleheads will connect when placed side-by-side, paying homage to the men who represent the Cavs in number “22”. On Friday, December 7th, when the Cavs take on the Sacramento Kings at The Q, all fans in attendance will receive a miniature Destination Cleveland “Cleveland” Script Desk Sign to proudly display their Cleveland pride at work or home! Destination Cleveland, the area’s destination marketing and management organization, champions the hard-working, vibrant and dynamic city the Cavs are proud to represent on the court, in the community, across the country and to the world. Six Cleveland script signs are located throughout the region. Cavs fans can stop by Edgewater Park, North Coast Harbor, Abbey Avenue in Tremont, Villa Angela Euclid Beach, The Foundry and Cleveland Hopkins International Airport to take photos at one of the signs with the iconic Cleveland skyline in the background. Throughout 2018-19, the Cavs will host new and returning theme nights at The Q focused on community, health awareness and special NBA initiatives. The Cavs will continue to support community needs by donating toys and food, and encouraging their fans to join them, at select games throughout the season. The annual Toy Drive will take place over the course of six games between Saturday, November 24th vs. Houston Rockets and Saturday, December 8th vs. Washington Wizards. In the spring, the Harvest for Hunger Food Drive takes place over the span of three games: Monday, March 18th vs. Detroit Pistons; Wednesday, March 20th vs. Milwaukee Bucks; Friday, March 22nd vs. Los Angeles Clippers. The Cleveland Cavaliers 15th Annual Black Heritage Celebration (BHC) will tip off on Martin Luther King Jr. Day – Monday, January 21st when the Cavs take on the Chicago Bulls at Quicken Loans Arena at 1:00 p.m. This game will begin a month-long celebration themed “Empowering and Inspiring. One Generation to the Next.” These special BHC theme nights will take place on Saturday, February 2nd vs. Dallas Mavericks, Monday, February 11th vs. New York Knicks and Saturday, February 23rd vs. Memphis Grizzlies. A fan-favorite tradition, the 17th Annual Fan Appreciation Night presented by Discount Drug Mart concludes the regular season on Tuesday, April 9th when the Cavs host the Charlotte Hornets at The Q. During this signature celebration the Cavaliers will thank the best fans in the NBA for their season-long support by giving away over $1 MILLION in prizes! Fans can purchase single game tickets for all home preseason games and the entire 41 regular season 2018-19 home game schedule NOW at Cavs.com/Tickets. 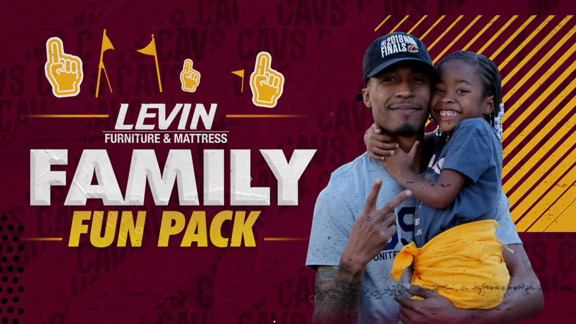 Levin Furniture Family Fun Pack – Make it a family night out at The Q on Saturday and Sunday home Cavs games! The Levin Furniture Family Fun Pack and includes four (4) tickets and four (4) fan meals (Sugardale Hotdog, small Pepsi and bag of chips). Starting at just $32.50 per ticket, fans will score savings of over 40% off of regular ticket prices. Available in Loudville or lower level seating, while supplies last. Buds Night Out presented by Budweiser – Back by popular demand, fans can enjoy any regular season Tuesday game this season with their “favorite bud” by taking advantage of the Buds Night Out ticket deal which includes two (2) Loudville tickets and two (2) Budweiser beers for only $50, while supplies last. Members of the Cavaliers Wine & Gold United -- the Cavs official season ticket membership platform -- and members of the Cavs free Wine & Gold Nation fan club were given an exclusive, early access to this season’s promotional schedule. In addition, members of Wine & Gold United will be able to vote on the giveaway item for annual Fan Appreciation Night. To receive exclusive access and updates on future Cavs news, be sure to register for a free Wine & Gold Nation profile at Cavs.com/Profile. Fans can learn more about Wine & Gold United season ticket memberships at enroll.cavs.com. NOTE: All promotional schedule giveaways and theme nights are subject to change. 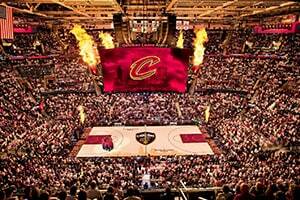 The Cavs promotional schedule features four Bobblehead Nights, Family Fun Packs, Buds Night Out and much more. Visit Cavs.com/Promos for the full list.